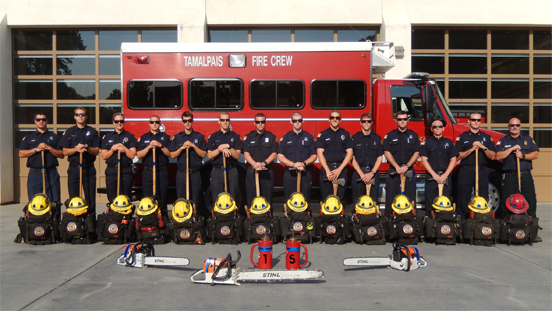 The Tamalpais Fire Crew began as the Tamalpais Fuel Crew based on two firefighters joking that a county handcrew made up of seasonal firefighters would be a great idea. Graham Gronomen and Tim Walsh transitioned the joke into a serious brainstorming session. The MCFD staff approved a two week experiment where seasonal firefighters would cut vegetation on the Indian Fire Road creating burn piles. Graham borrowed enough equipment and recruited seasonals to participate in the experiment. He spent countless hours working on chainsaws and driving to MCFD stations to borrow chaps and other tools. Without his dedication, the program would have surely failed. Jesse Rudnick also spent numerous hours dedicated to the success of the program. Jesse and Graham were the initial Squad Bosses providing leadership in the field. The Fuel Crew began cutting brush on February 19, 2004. The experiment was paid for by FireSafe Marin and MCFD. The Crew cut brush for 8 days and from there, a new paradigm within MCFD was born. The program was more than just a vegetation management tool, it is used to build firefighter skills, work ethic, and leadership competency among the firefighters that will become the future of MCFD and other fire agencies throughout the county. Many new lessons were learned during the pilot project. First and foremost, it was very possible to have fun while making a difference! Coming in a close second...burning piles was fun! And lastly, it was ok to have fun! Fun is a relative term. Running a chainsaw eight hours a day might not have been fun to some. Cutting large stands of old growth poison oak might not have been either. Working on slopes greater than 80 percent steep while wearing firefighting gear did not appeal to many. Falling down was not the exception, but the rule. Bruising was so common that the Crew adopted the colors of black and blue to identify their gear. The enthusiasm for the Crew ran high among the members and the County Fire Chief. Unfortunately, enthusiasm did not result in immediate funding, but a seed was planted. A fire season came and went and the seasonal employees were terminated. Walsh approached County Fire Chief Ken Massucco and asked to continue the project. The Chief approved the project if funding could be found. That winter and spring projects were implemented in Black Point (Novato), Indian Valley (Novato), Indian Fire Road (Kent Woodlands) and the Evergreen Fire Road (Kent Woodlands). Without the sponsorship of Novato Fire Protection District, Marin Municipal Water District, FireSafe Marin, the College of Marin, the Marin County Open Space District, and the Kentfield Fire Department, the second unofficial pilot project would not have happened. Due to a wet spring, the Fuel Crew burned into the month of May. The seed that was planted earlier began to germinate. Chief Massucco asked for a budget to be prepared to fund a “Fire Crew” to continue vegetation management, and also function as a handcrew to attack fires throughout the county. With input from firefighter Keith Wallace and Walsh, the County Administrative Service Officer drew up a budget for the Chief’s approval. The Crew was not optimistic due to the cost of starting a program of this magnitude. On May 20, 2005 the fire chief walked into the prevention trailer at Woodacre Headquarters and announced that the Tamalpais “Fire” Crew should be prepared to be operational by July 1, 2005. The new crew consisted of Walsh as the Crew Superintendent and Keith Wallace functioning as a Squad Boss. All they were missing was a Foreman, 10 firefighters, vehicles, and a fire station. That was soon remedied!